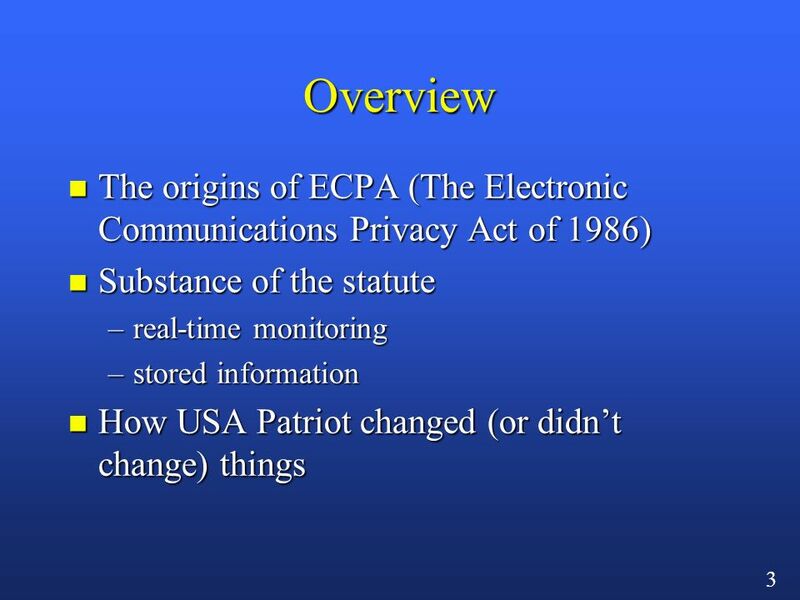 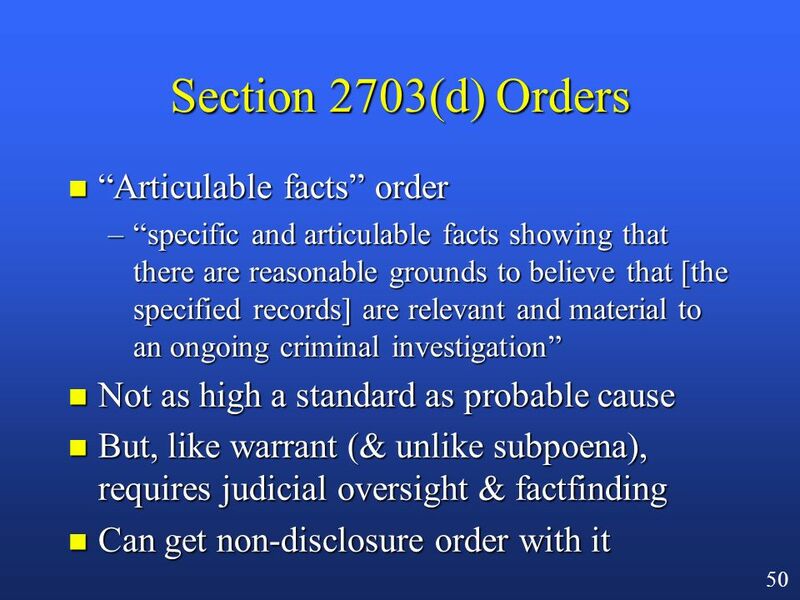 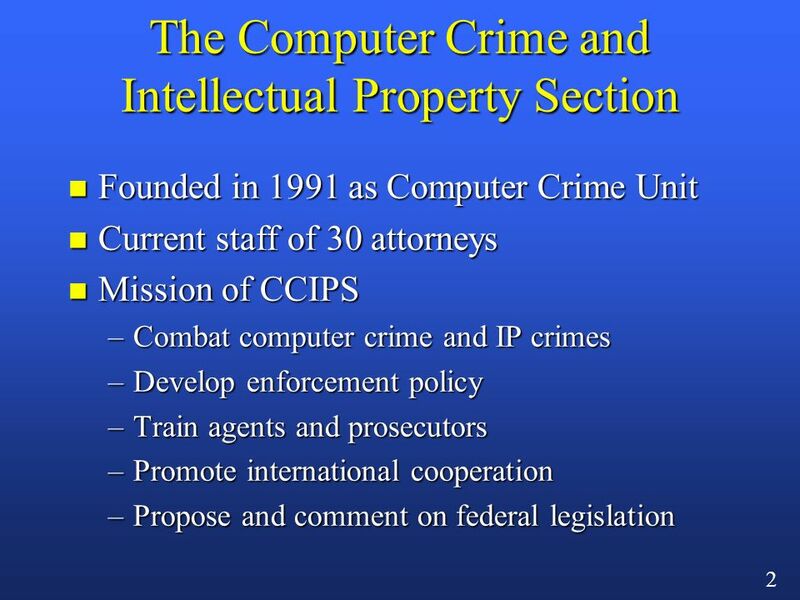 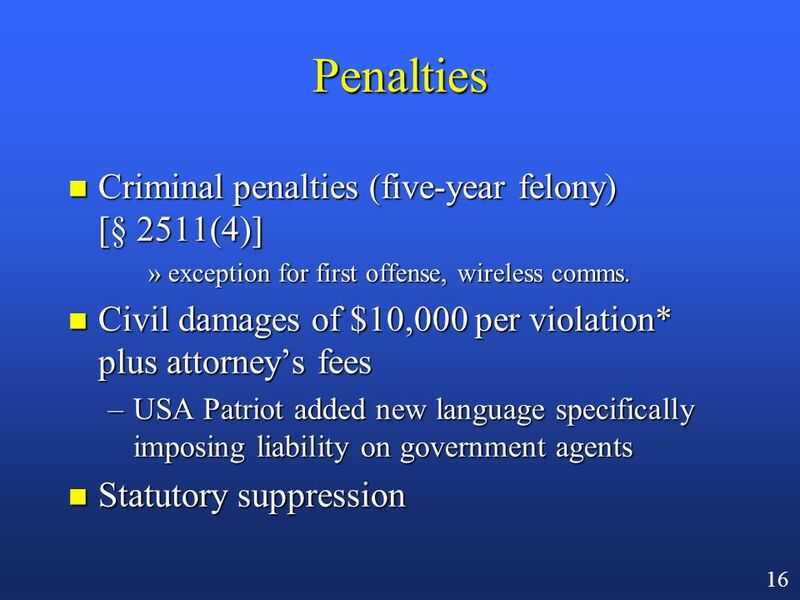 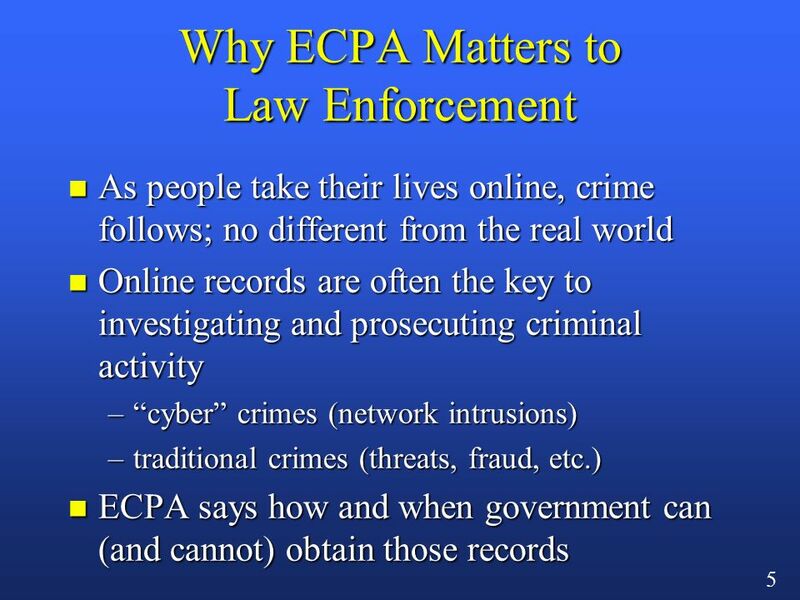 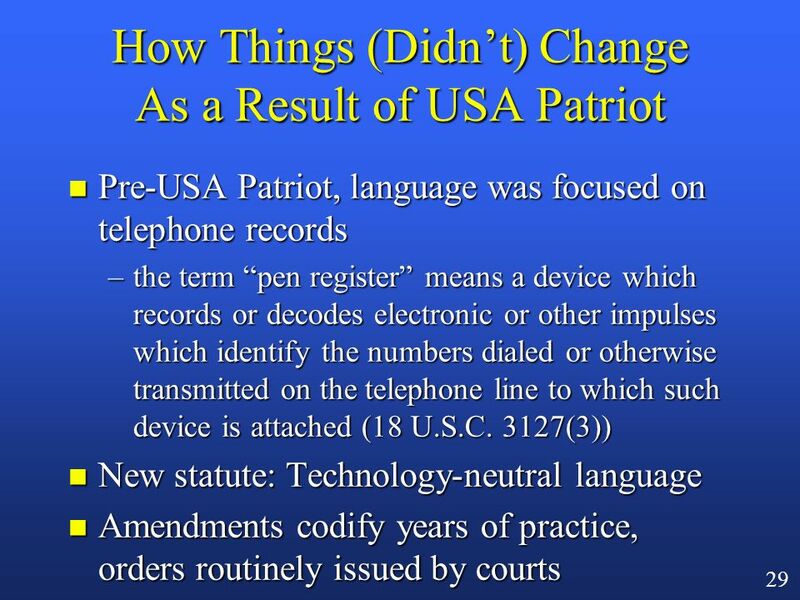 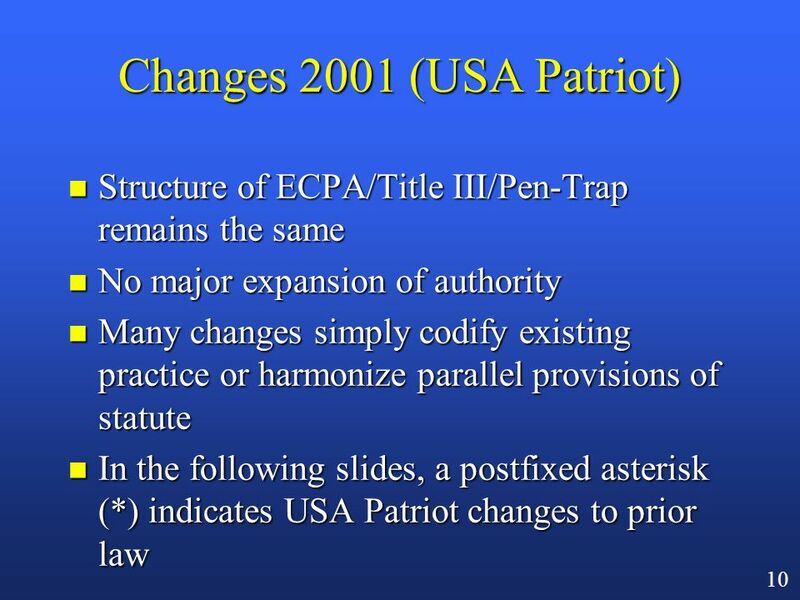 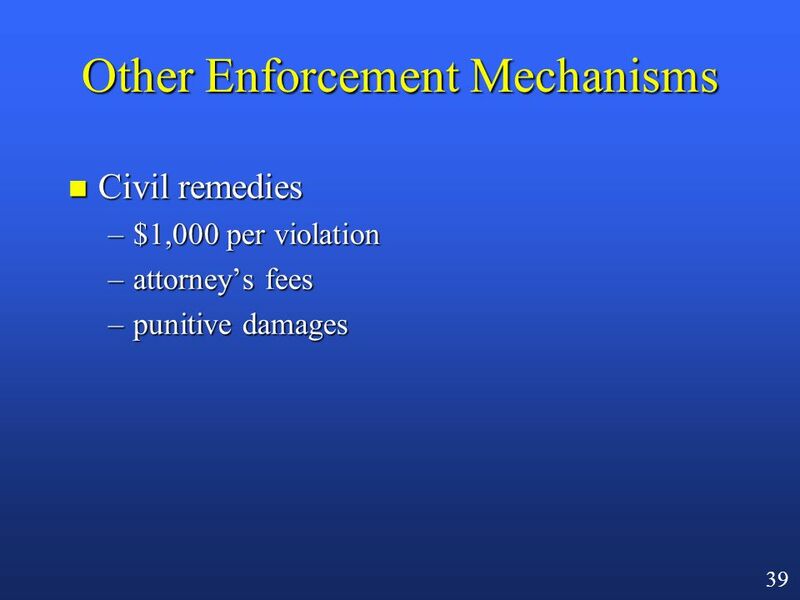 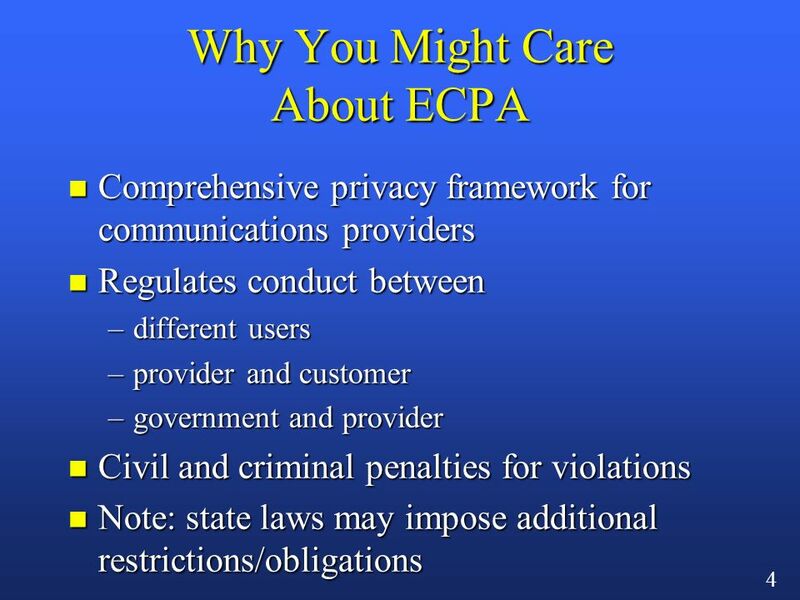 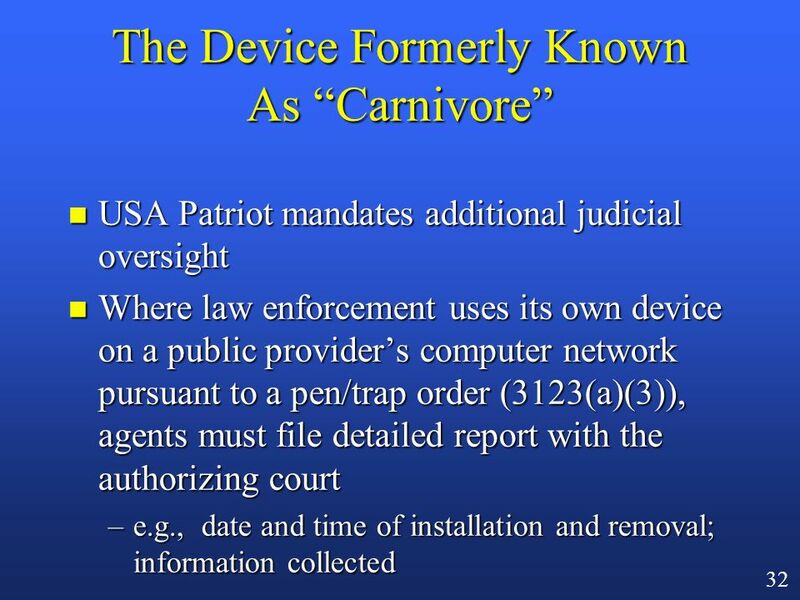 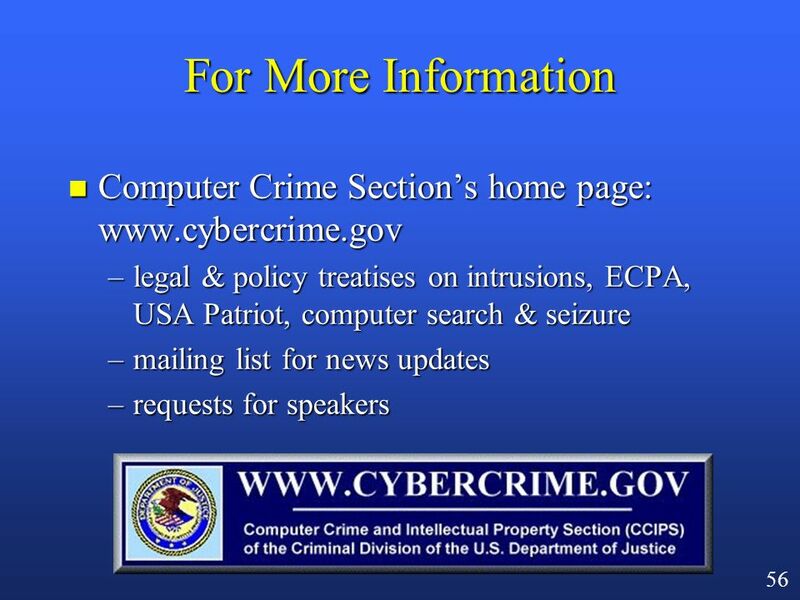 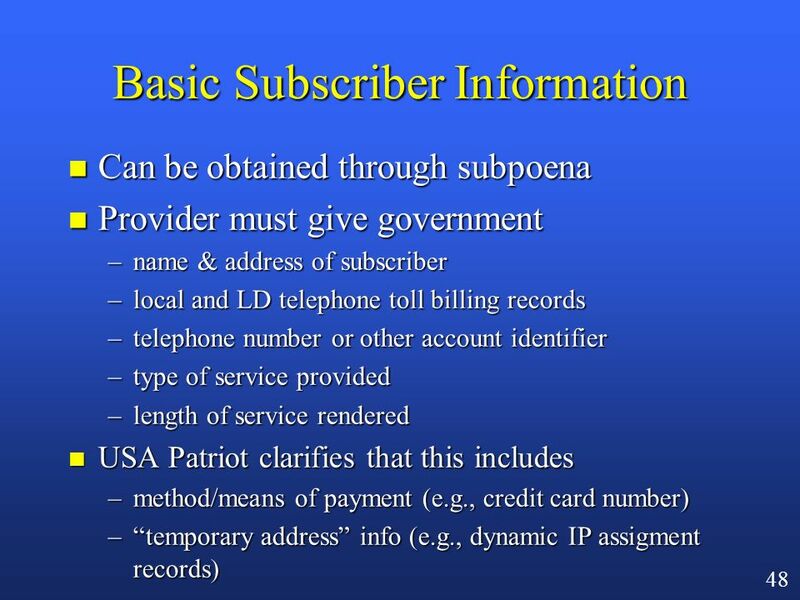 1 Online Criminal Investigations: The USA Patriot Act, ECPA, and Beyond Mark Eckenwiler Computer Crime and Intellectual Property Section U.S. Department. 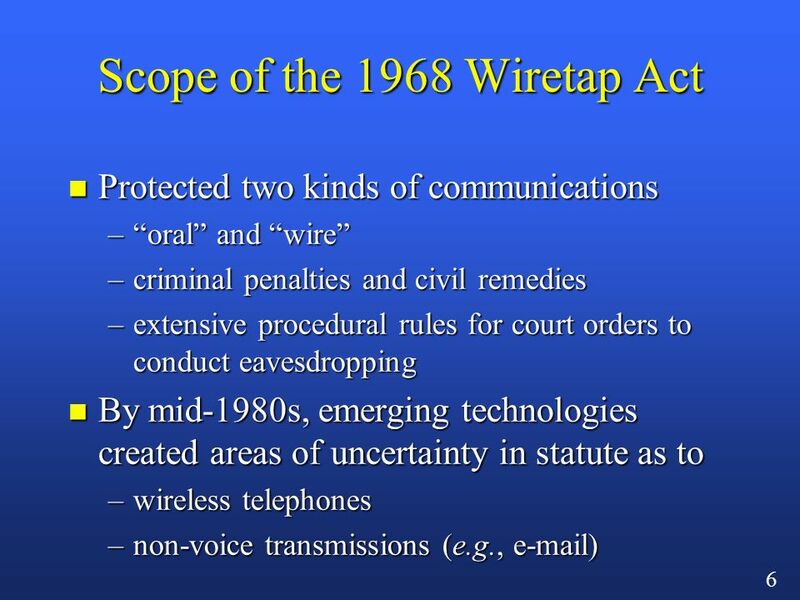 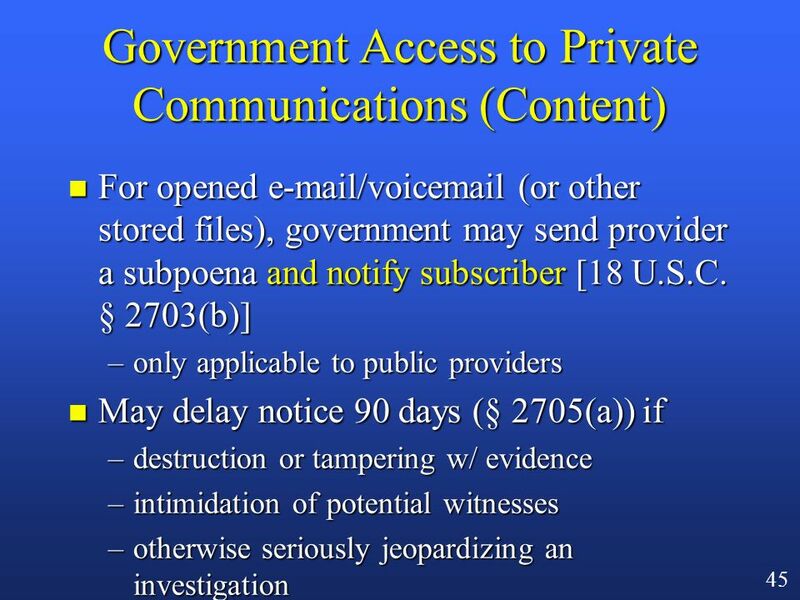 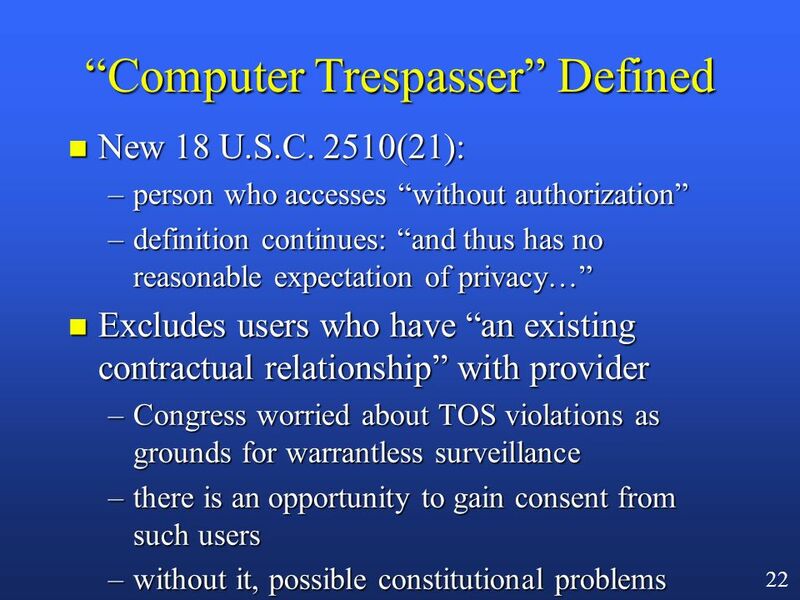 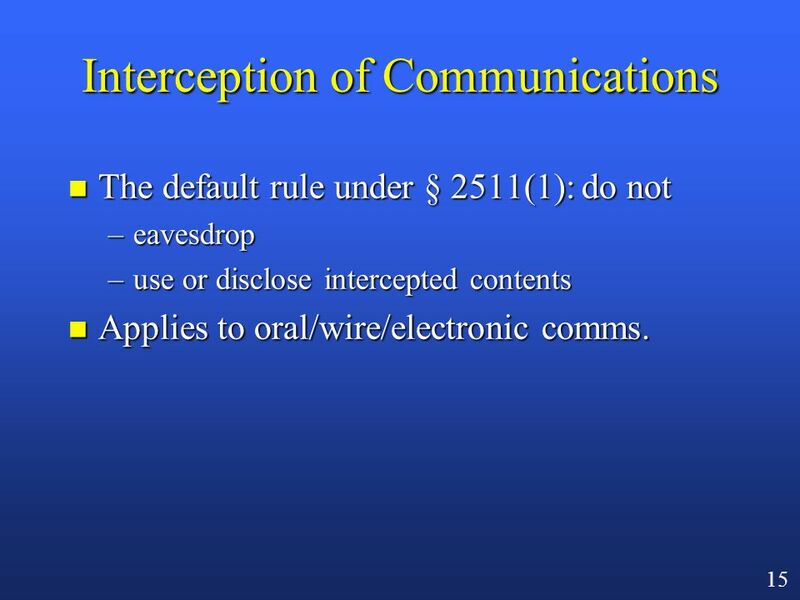 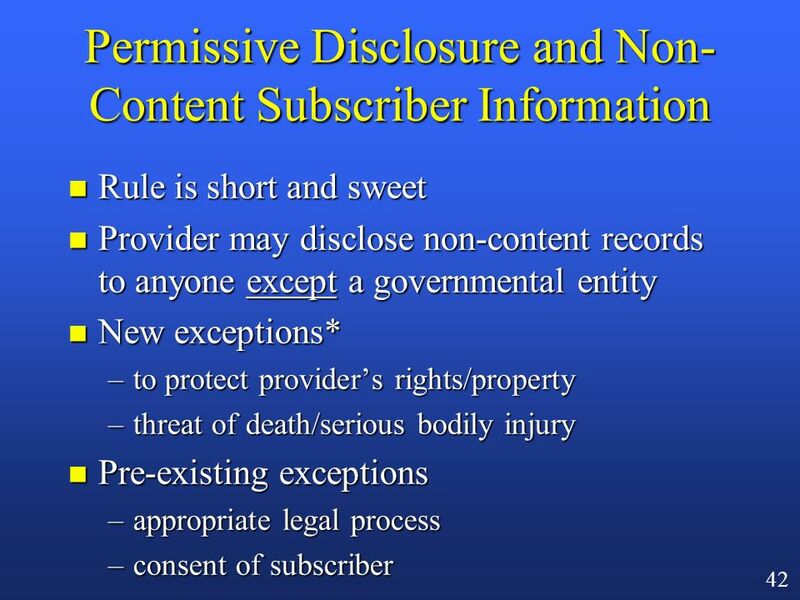 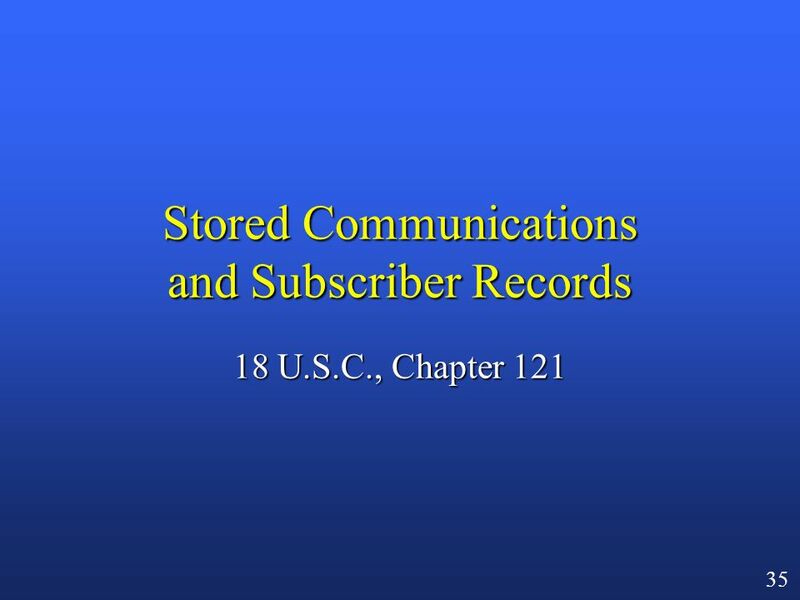 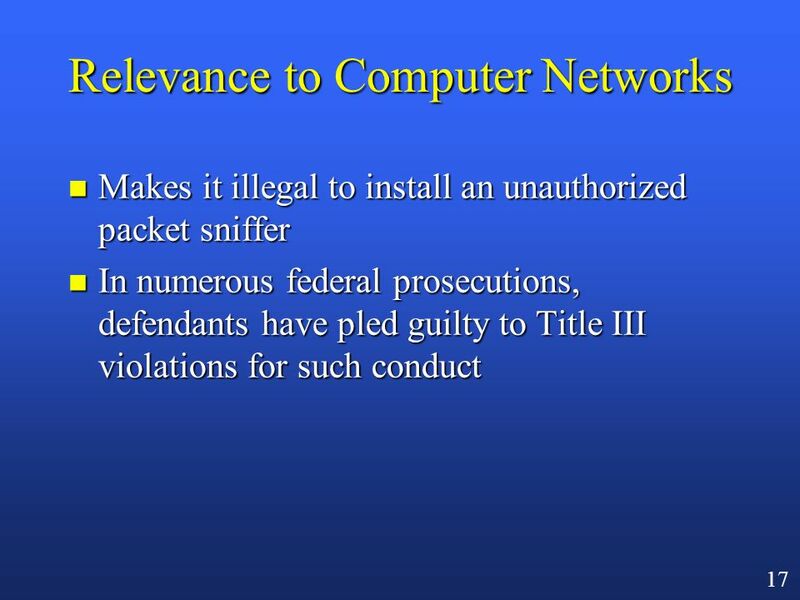 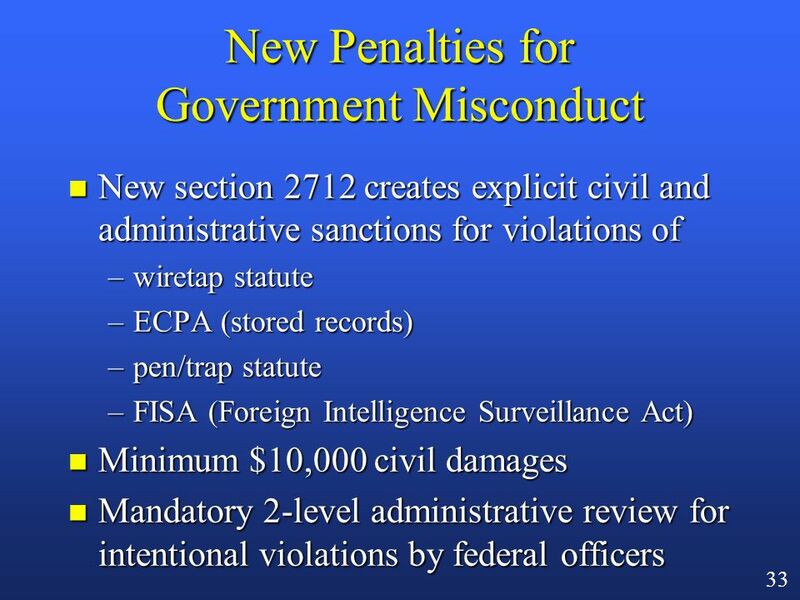 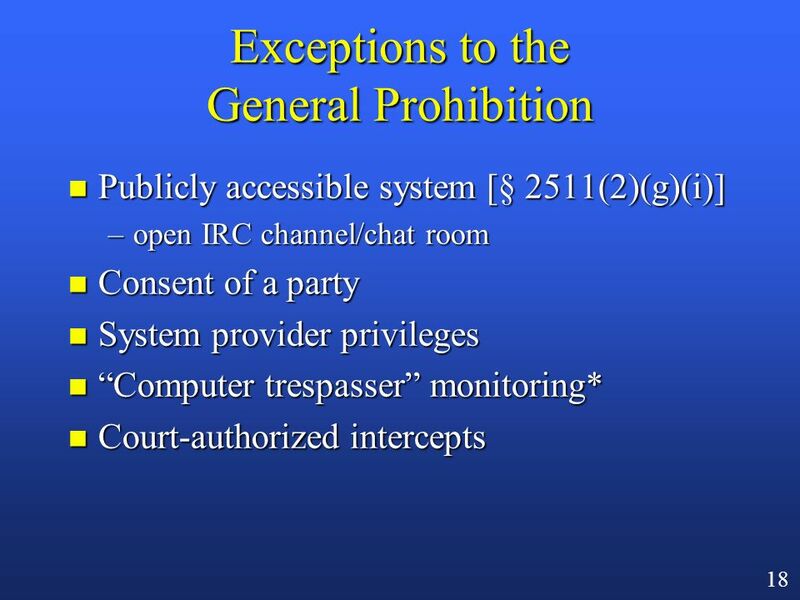 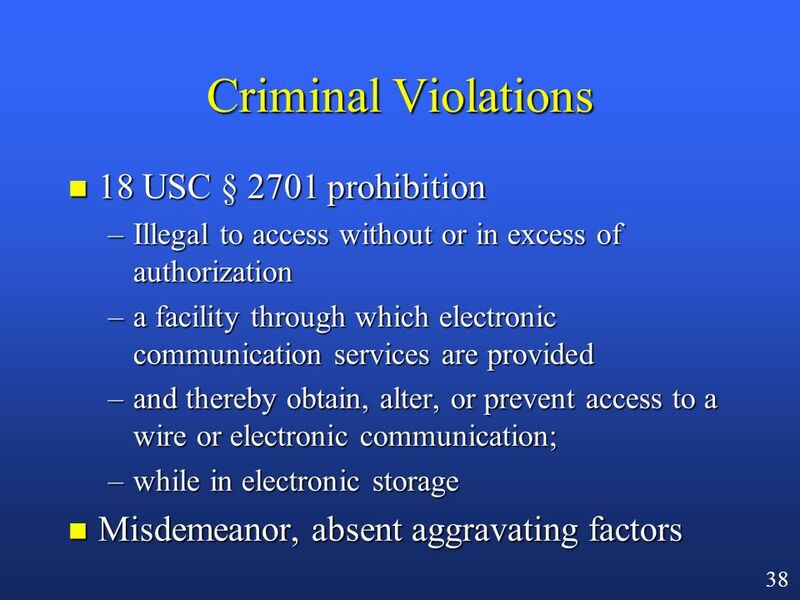 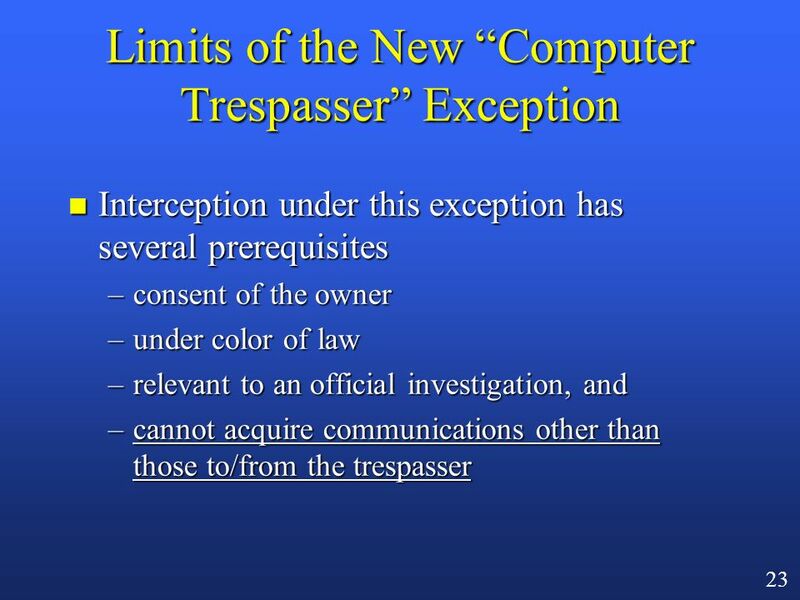 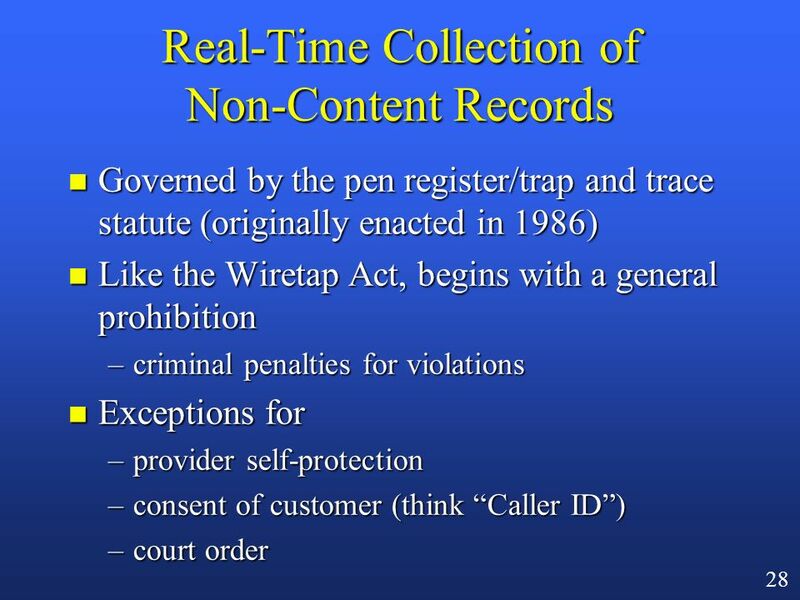 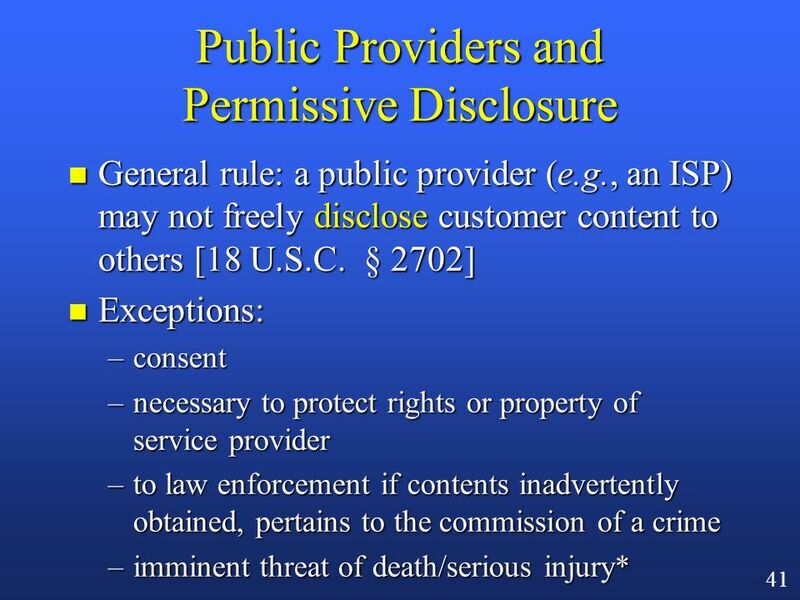 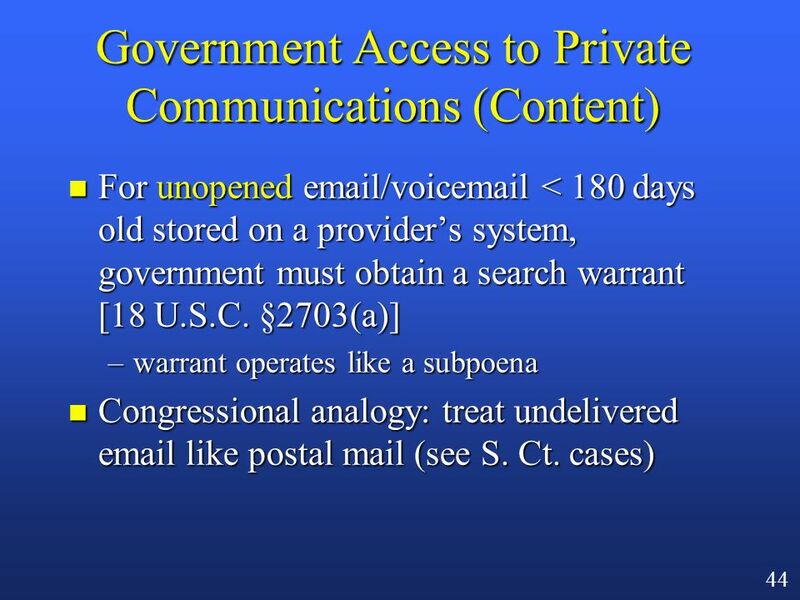 16 15 Interception of Communications n The default rule under § 2511(1): do not –eavesdrop –use or disclose intercepted contents n Applies to oral/wire/electronic comms. 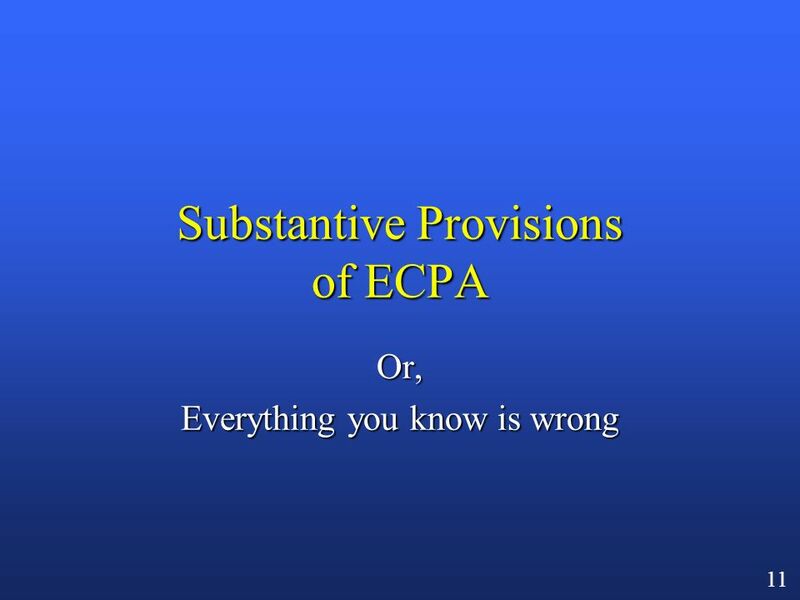 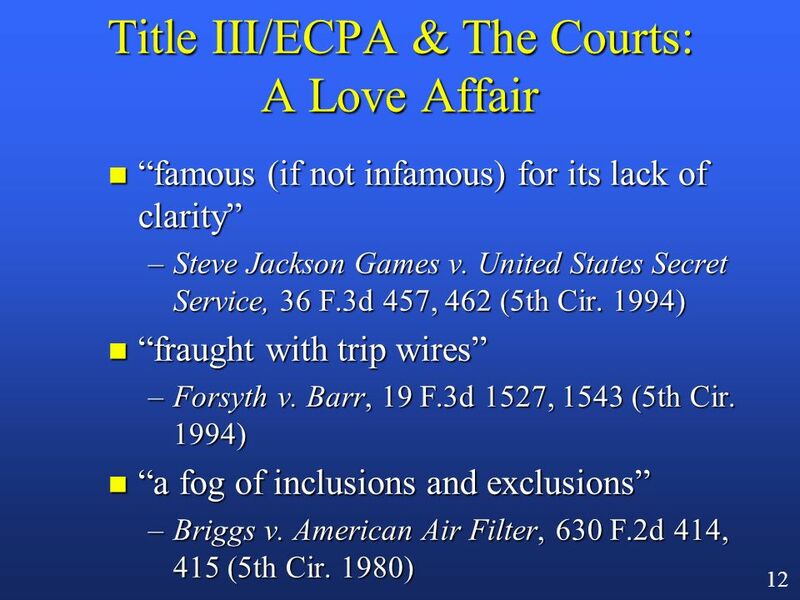 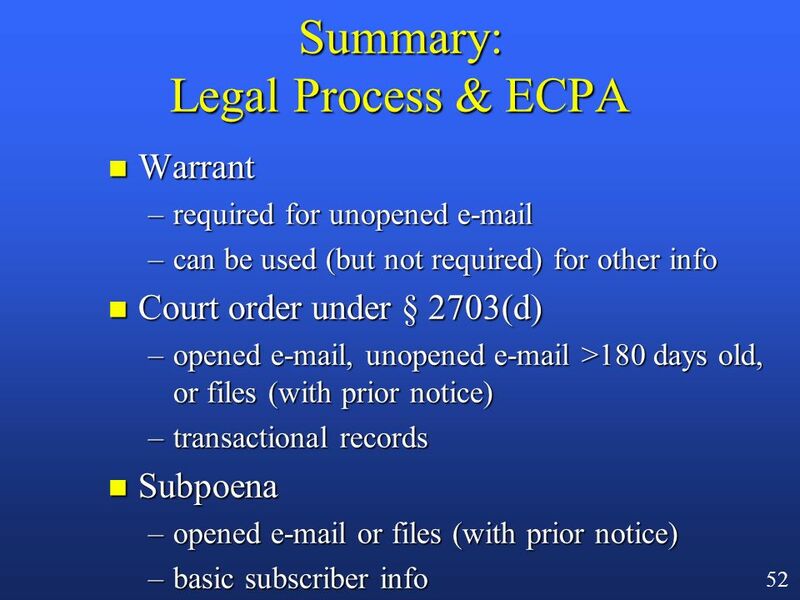 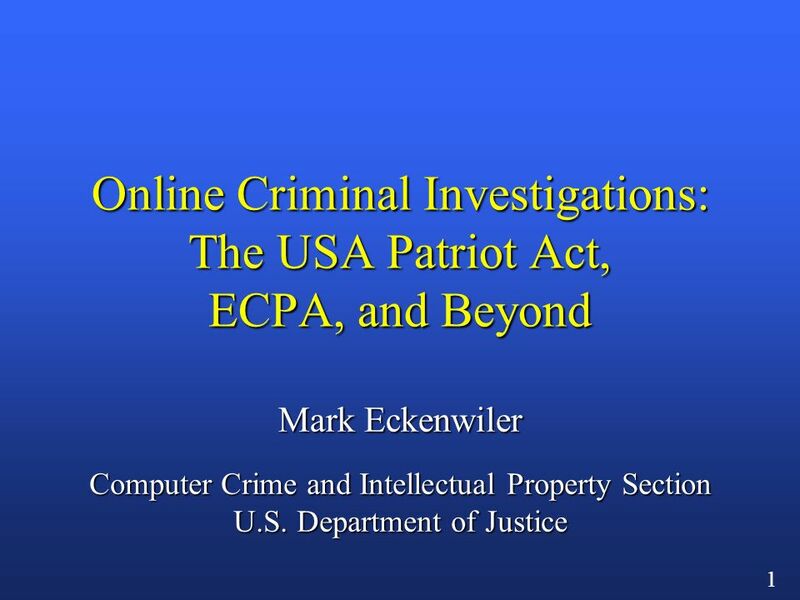 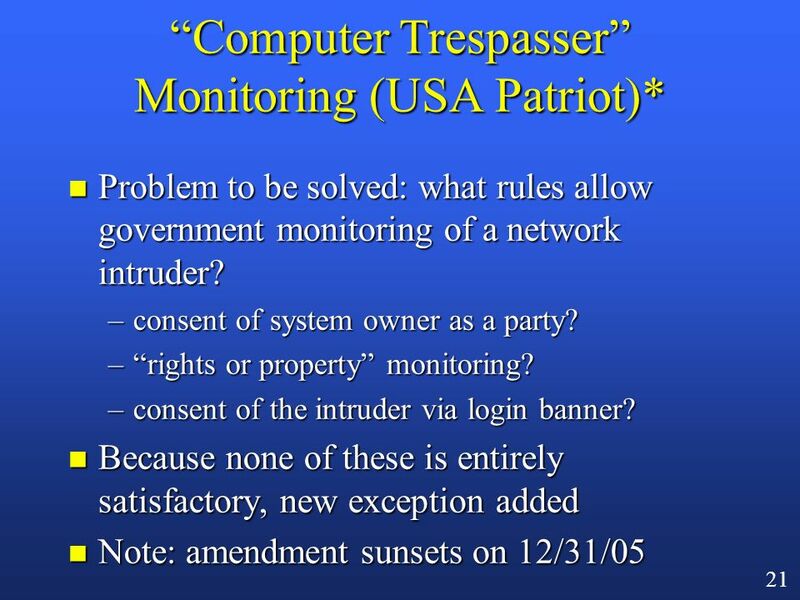 Download ppt "1 Online Criminal Investigations: The USA Patriot Act, ECPA, and Beyond Mark Eckenwiler Computer Crime and Intellectual Property Section U.S. 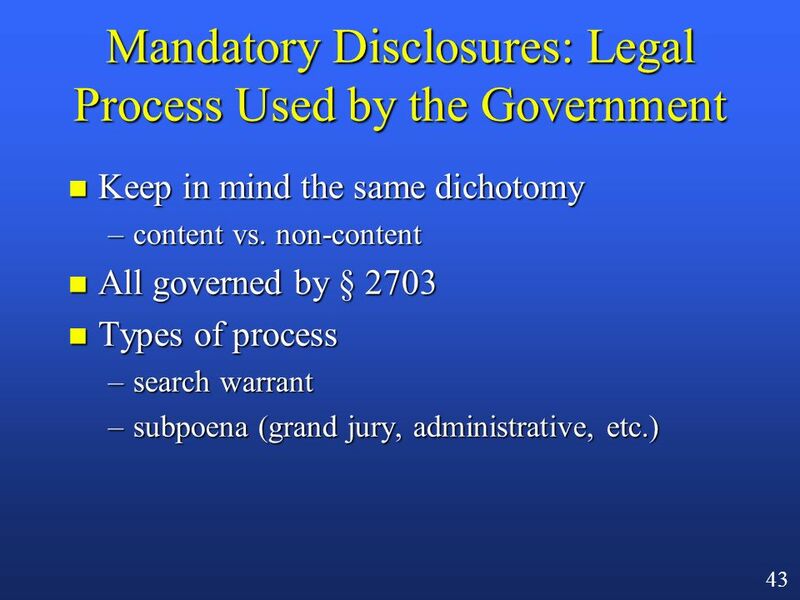 Department." 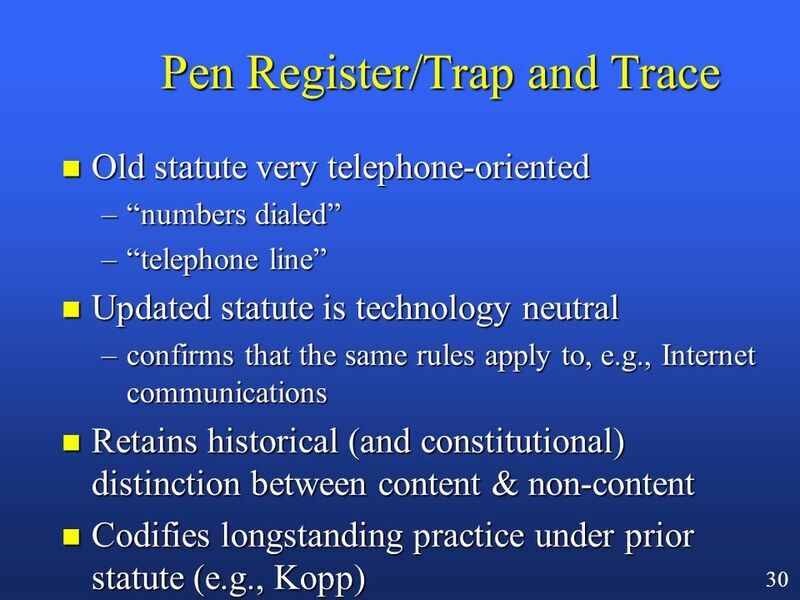 SURVEILLANCE: opportunities and pitfall David Matthias QC and Ryan Kohli. 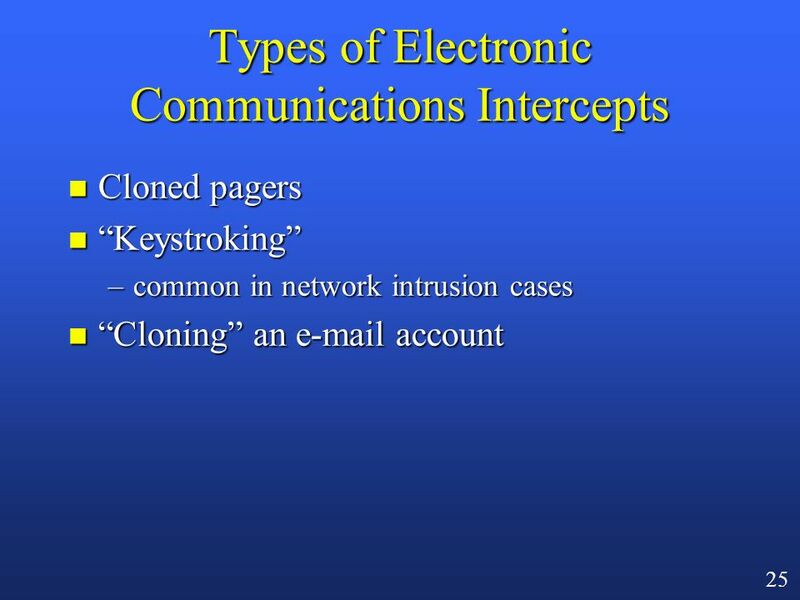 Electronic Surveillance, Security, and Privacy Professor Peter P. Swire Ohio State University InSITes -- Carnegie Mellon February 7, 2002. 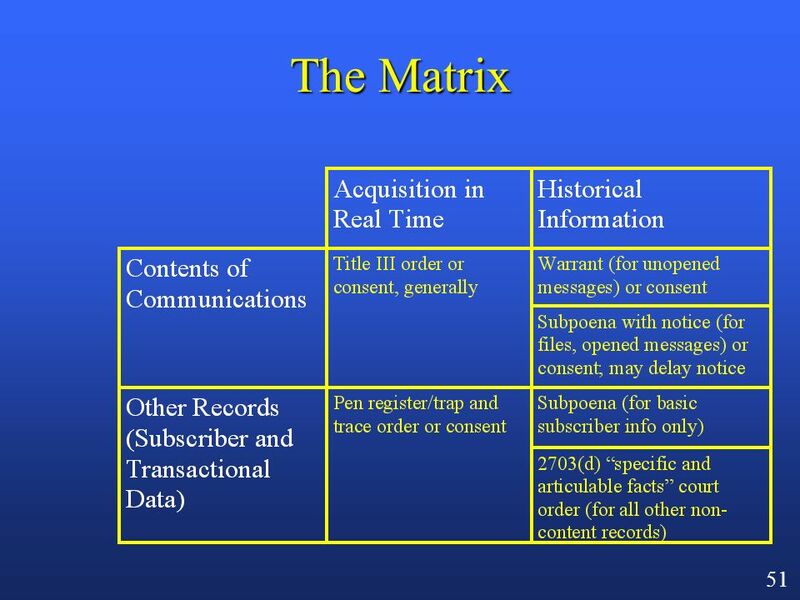 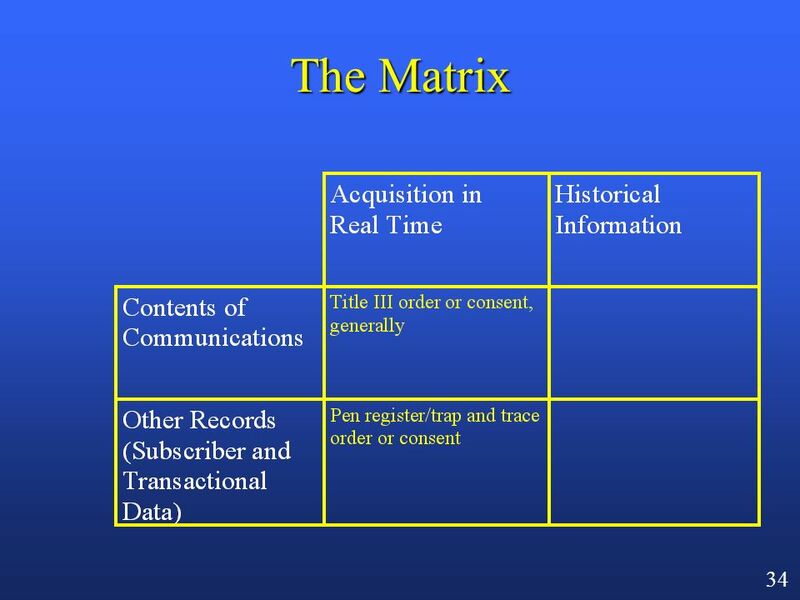 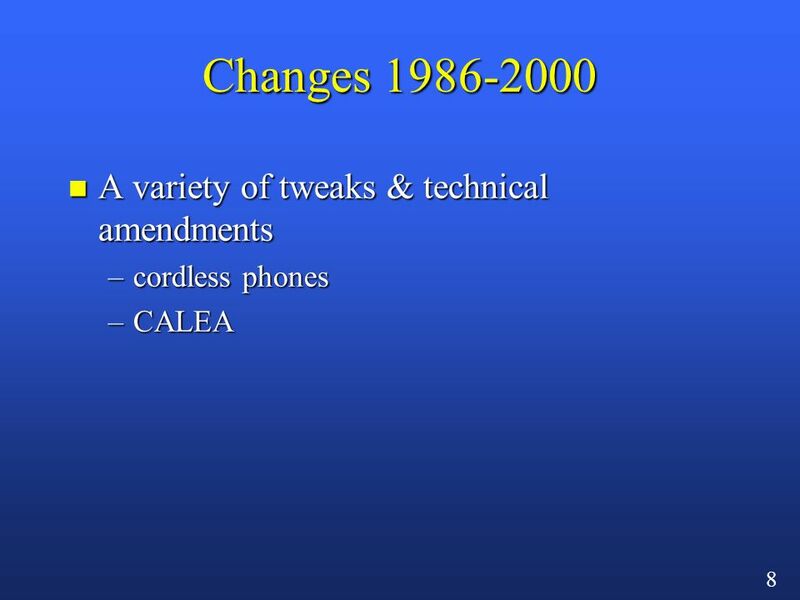 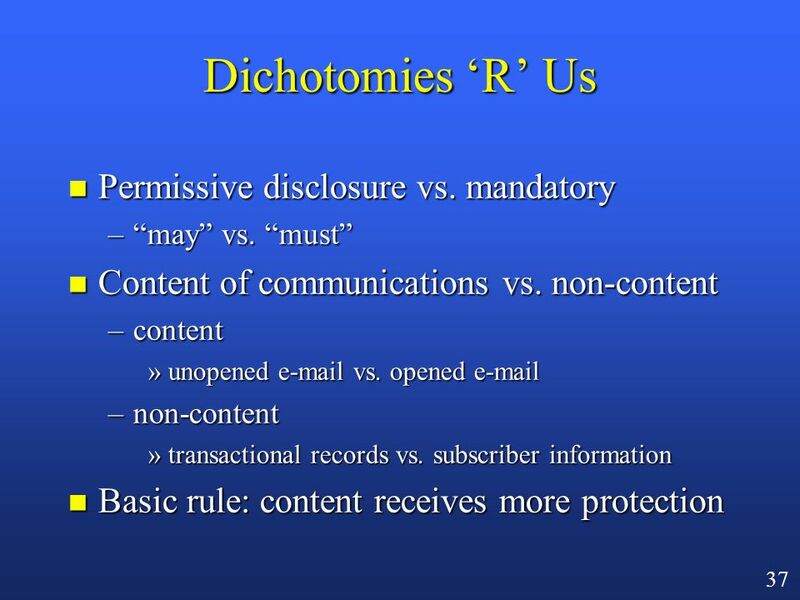 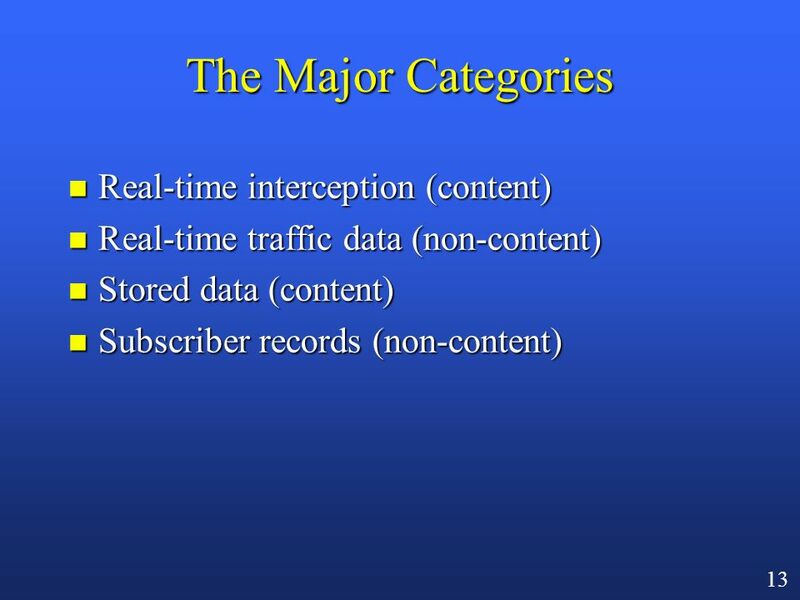 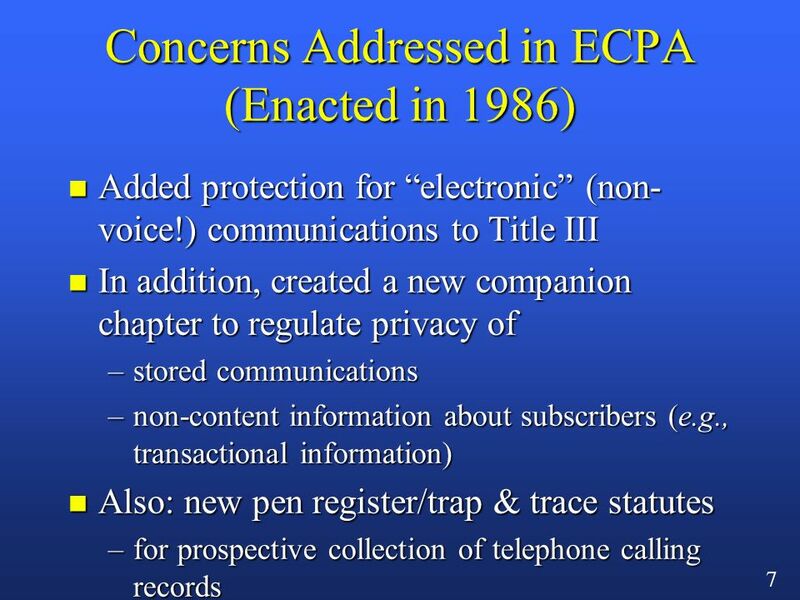 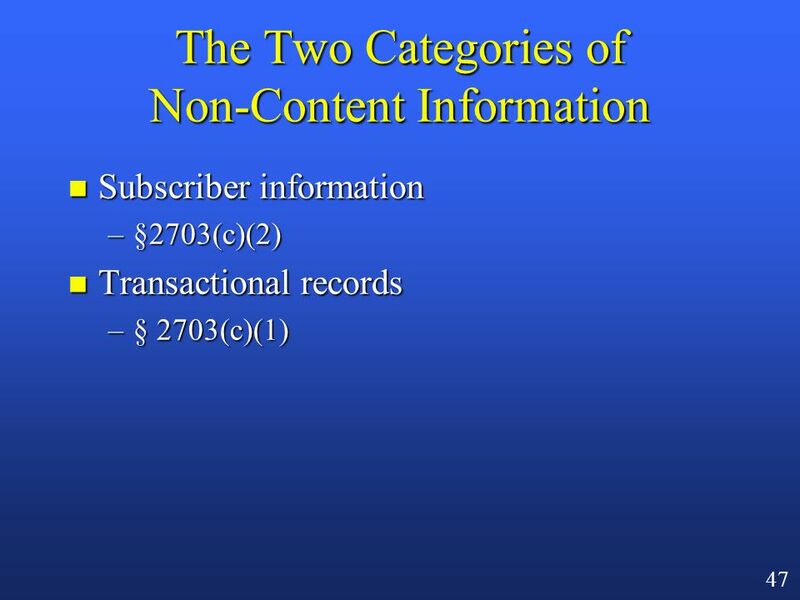 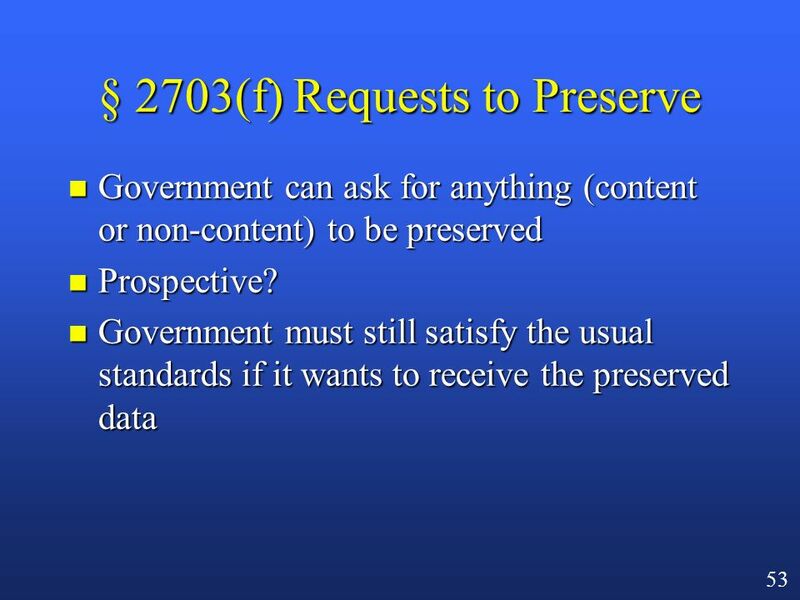 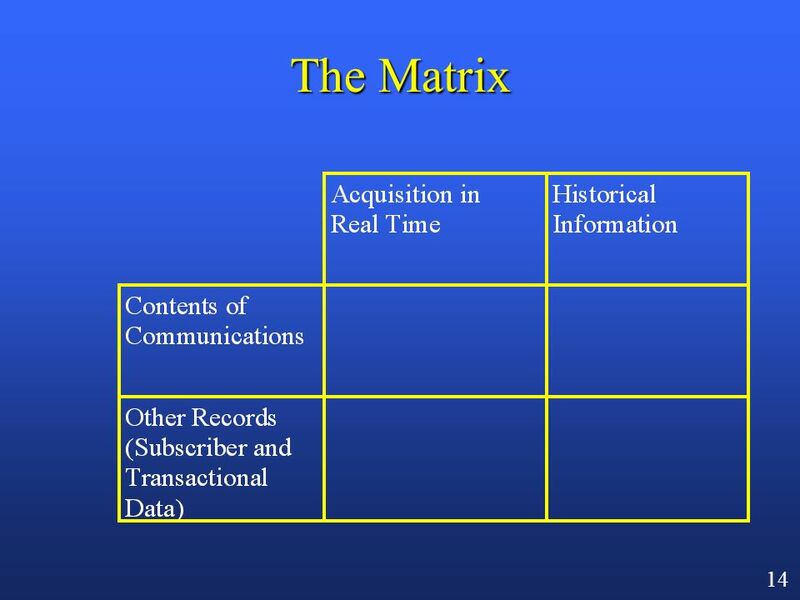 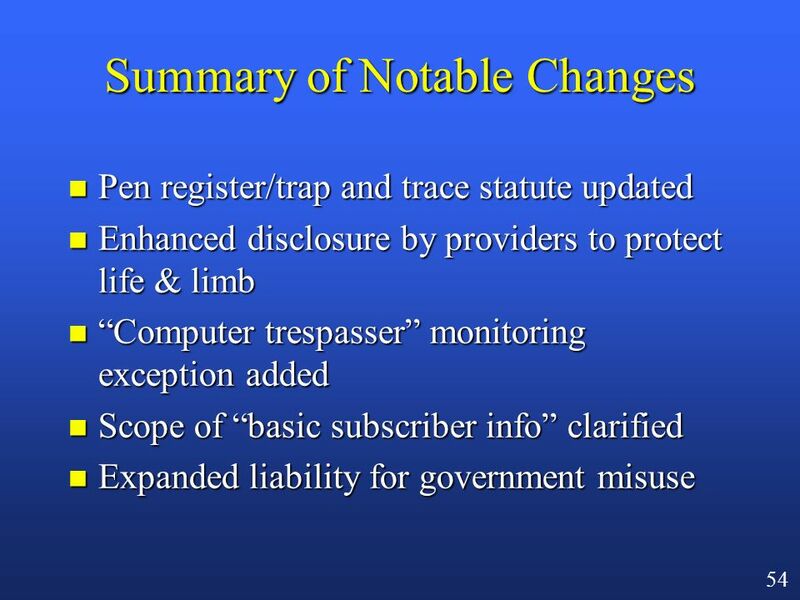 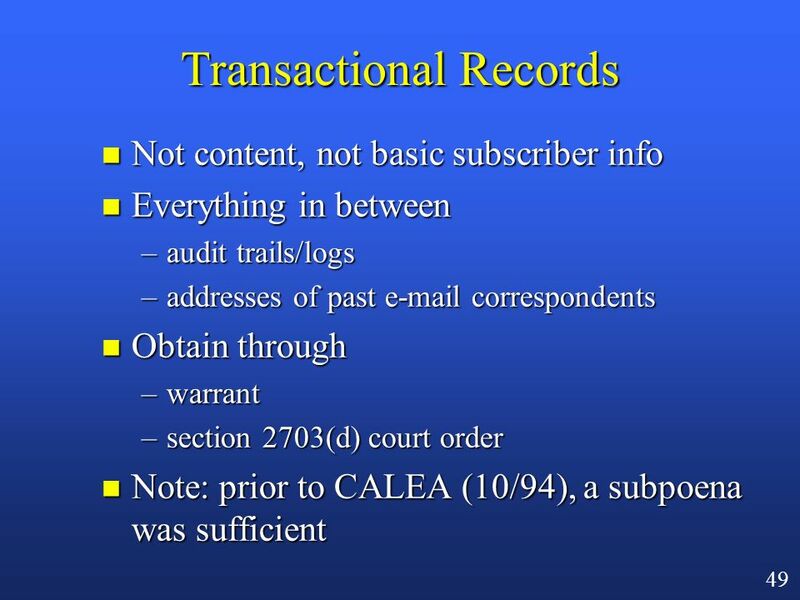 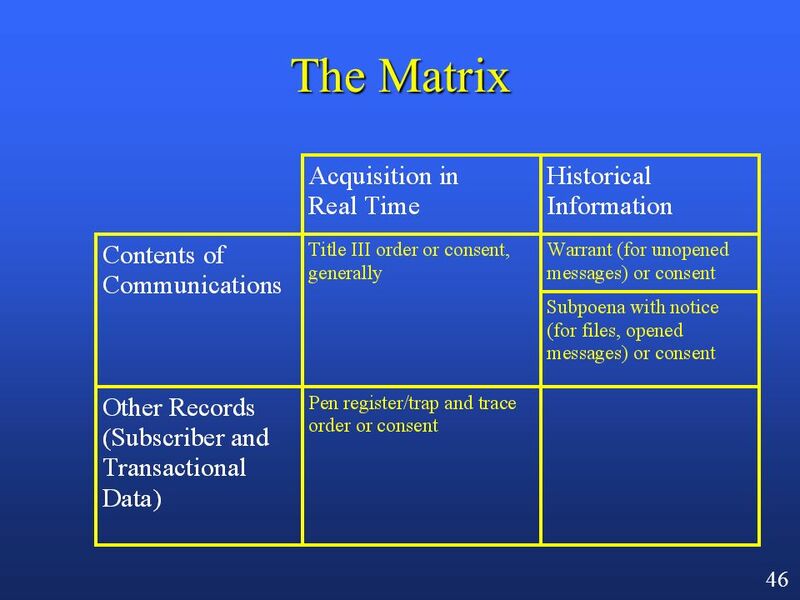 Key New Surveillance Provisions Professor Peter P. Swire Ohio State University Privacy 2001 Conference October 4, 2001. 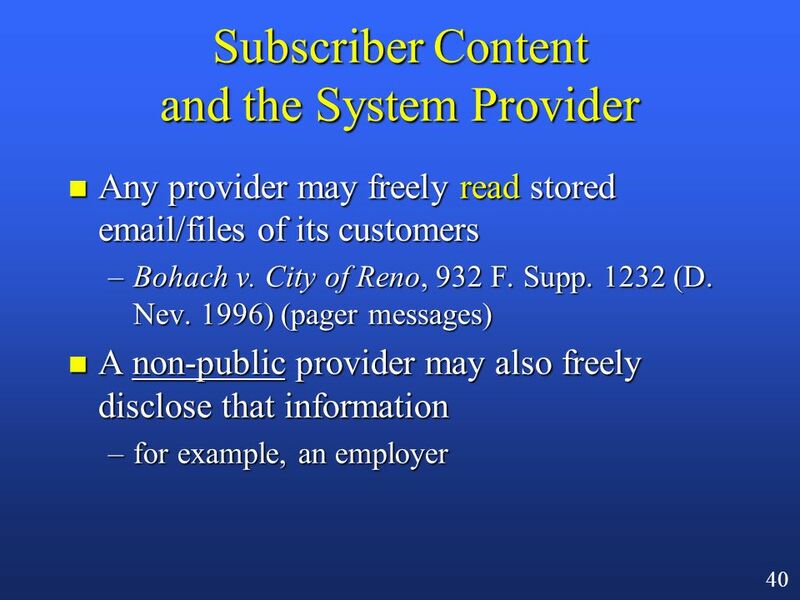 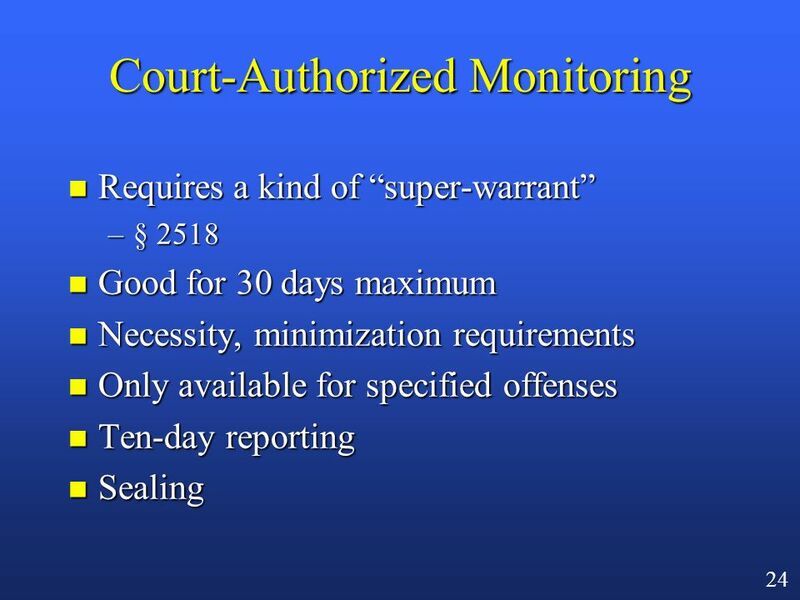 1 ON- LINE TRAINING EVENT HIPAA (Health Insurance Portability & Accountability Act) ENTER. 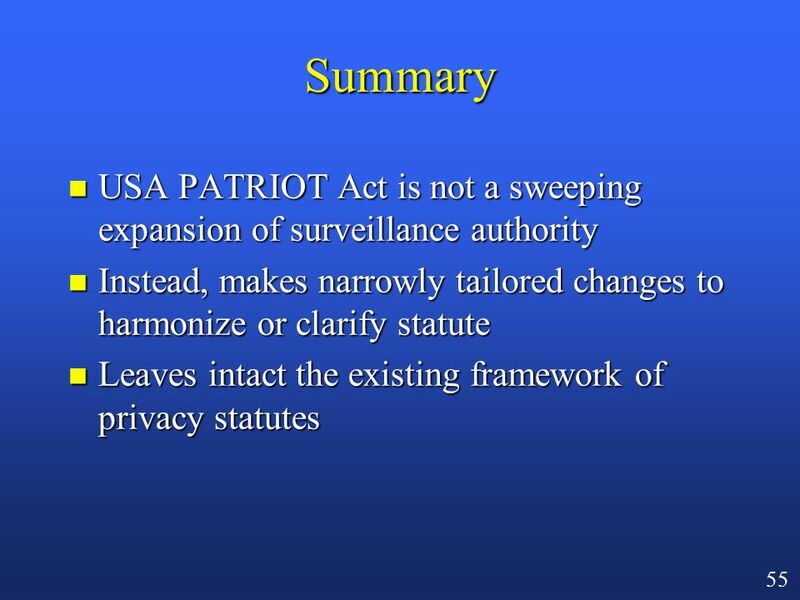 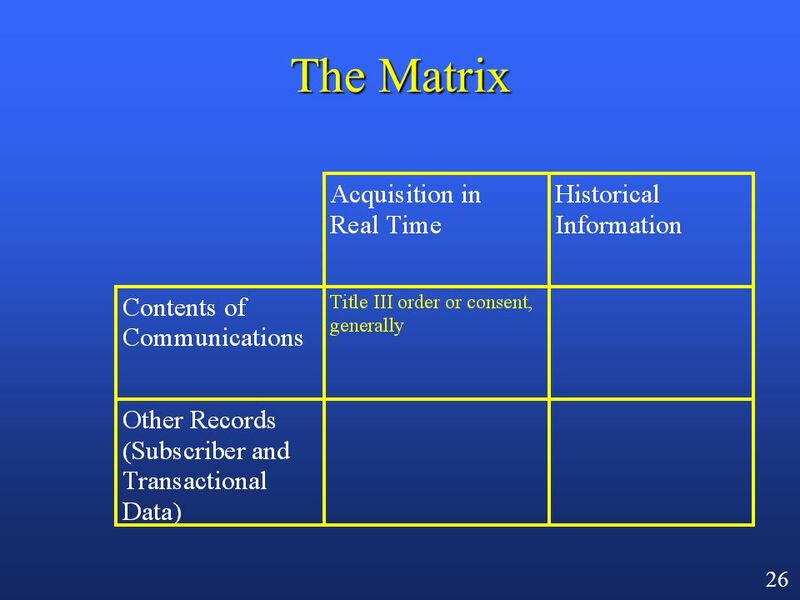 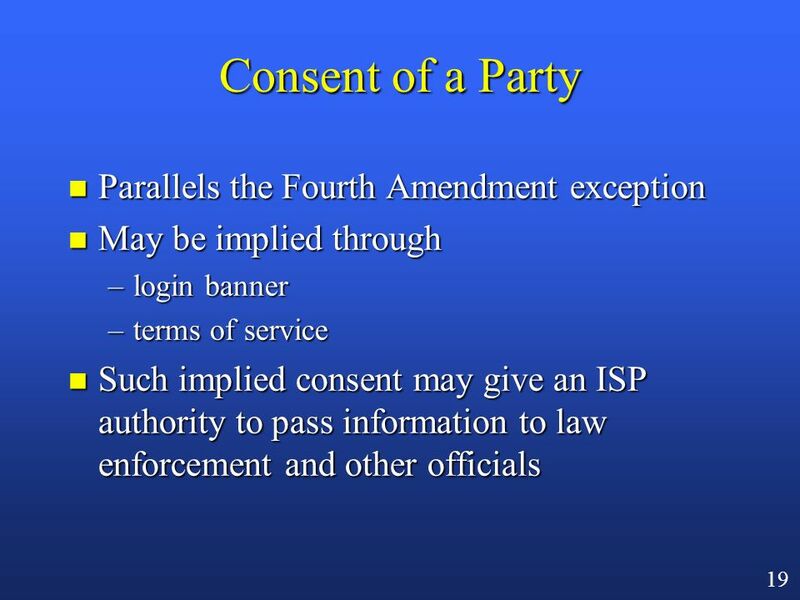 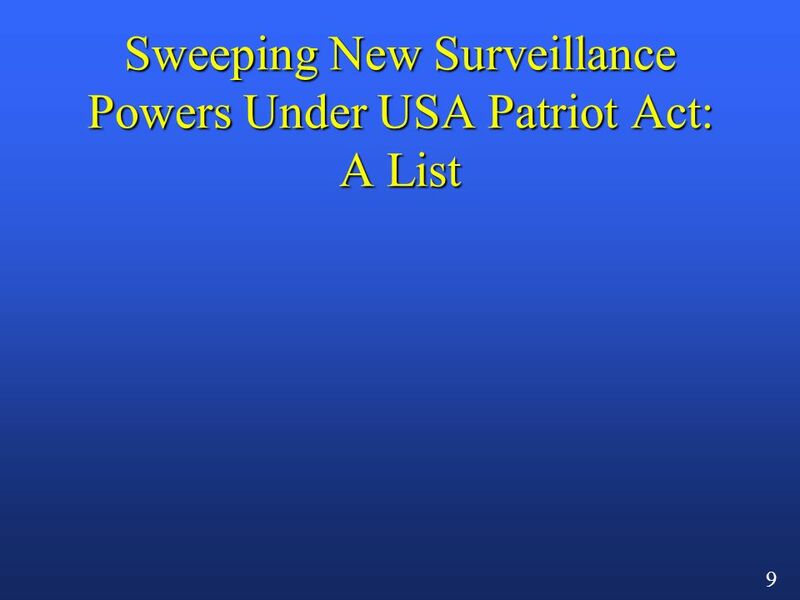 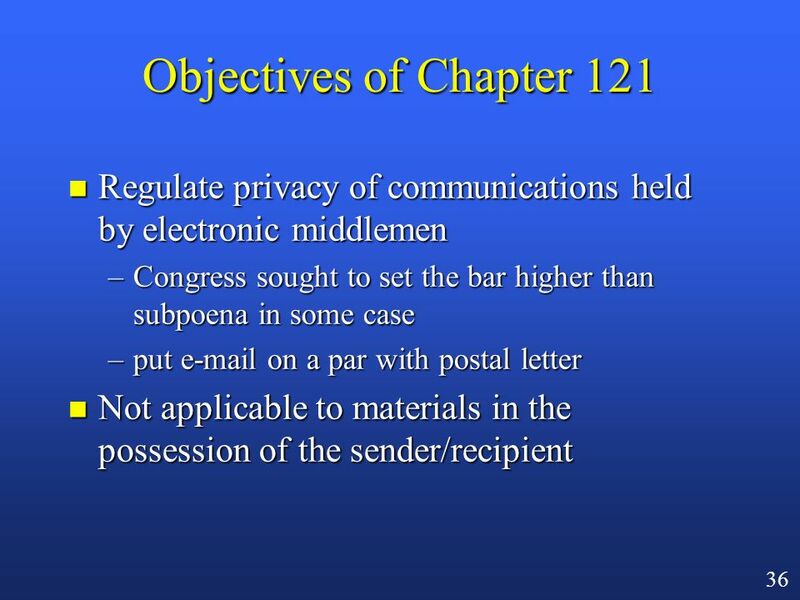 Chapter 18 - The Fourth Amendment and National Security.